An upbeat song, inspired by a fantastic vacation in South Africa a few years ago. 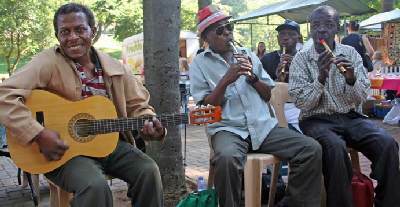 Kwela is a music style that started in the townships in South Africa in the 50s. It is originally based around simple guitar and penny whistles and normally follows a I, IV, I(6/4), V - chord progression. Since then the style has been developed by groups like Mango Groove. I have given the style my own variation here. Heavy on drums and penny whistles naturally. But lots of other instruments. Two scarbee bases (fat and slap), ukulele, Rhodes, piano, a little synth pad, acoustic guitar, melodica, pluck piano (sounds like an African home made string instrument), mandolin, kora, African marimba, bolon, African percussion, and an African food market. 22 tracks. Crank that volume up and make some space on the floor to dance. Here we go! Warm Hearts Kwela, sent from the cold north.